The Boston College Center for Corporate Citizenship(BCCCC) released a key report this week that allows a unique insight into theprofession of corporate citizenship, i.e., professionals working in the areasof corporate responsibility and sustainability. With a broad definition for corporatecitizenship: "How a company takes responsibility and is accountable for managingits social and environmental impacts on society across the business, from thedesign of products and services, to the management of operations, to the way itworks beyond the fence line to help society address social and environmental challenges,also known as corporate social responsibility (CSR)," the survey polled650 individuals. We've had several surveys in recent months talkingabout corporate sustainability, from Acre Resource's Salary survey, Cone's survey on howlack of employee engagement is hurting company bottom lines,to last week's Global Compact CEO Study 2010 coproduced withAccenture, which reported that a majority of polled CEOs realize the criticalityof sustainability to business survival. This survey by the BCCCC lends itself to definingwho these professionals are working at companies to catalyze change,instrumentally redefine company culture and make sustainability central tobusiness strategy. With 61% of respondents working in global companies and82.5% from US-based organizations, the report shows a distinct progression ofcorporate responsibility as a professional career path, albeit with no oneclear background or foundation. Not only does this survey help define what alot of CSR folks do day in and day out, every day, it also establishes theprofession for companies grappling with placement, reporting structure andaligning skills with scope. 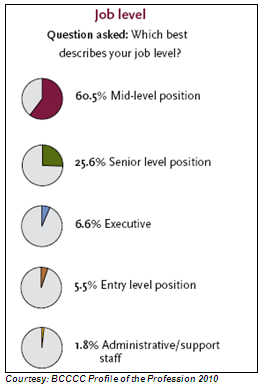 Some clear indicators pointed to a concrete gender disparity inthe field with women outweighing men by a 3:1 margin overall, but reducing toless than half in senior executive positions, with 49.7% of senior managementjobs accounted for by men. 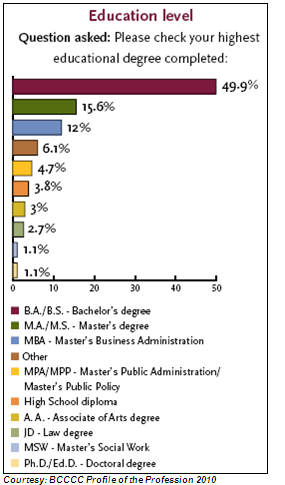 Educationalbackground also heavily weighted toward bachelor degrees atalmost half (49.9%) of the respondents, with 15.6% indicating a master's degreeand 12% owning an MBA (see graph to the left). All this rich data also enabledthe BCCC to come up with a uniquely robust profile of a typical professional inCSR as presented by the most common responses. Additional highlights from the report, which is exclusivelyavailable to BCCCC members, manage to together create a comprehensive frameworkof a corporate citizen. These results—while restricted to 650 respondents—shedimportant light on what skills, personalities and foundational experience makesfor an effective CSR professional. While by no means restrictive, with thecareer path in its nascence, these indicators should serve as relevant pointersfor job seekers, students—business school and undergraduate—as well asmid-level careerists either looking for a sustainable job, moving into aCSR-heavy work profile, or looking to align themselves more specifically withtheir employer's CSR mission. The full Profile of the Profession 2010 report is availableonly to Boston College Center members, but a two-page summary of the survey’sKey Findings is available to all. Also, please don'thesitate to leave a comment, email In Good Company orconnect with me on Twitter @VaultCSR.